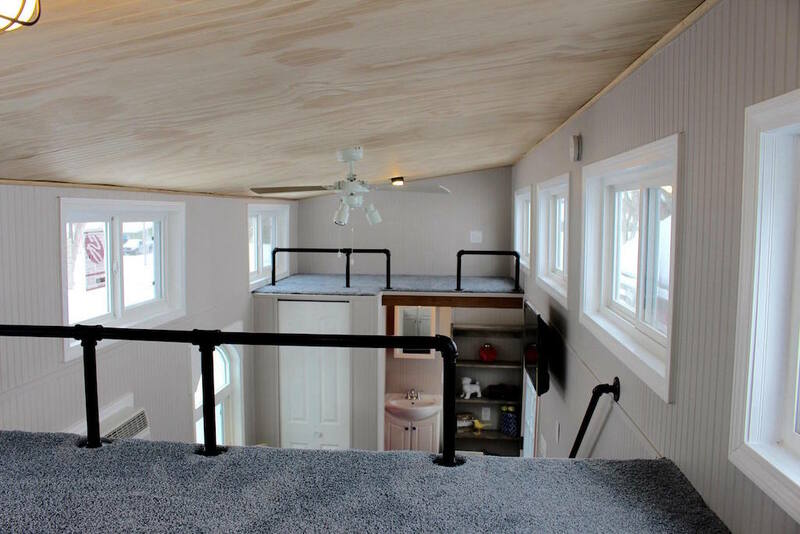 A 273 square feet (lofts included) tiny house in Saint Peters, Missouri. 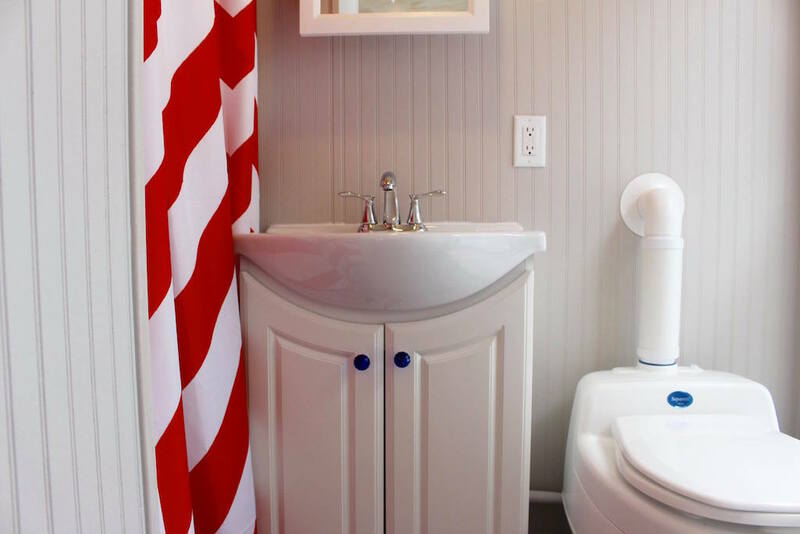 Designed by Mini Mansions Tiny Homes. More info. here. If you are interested in purchasing this tiny house, we are more than happy to make any changes you want. This is our base model at $39,900. Lots of nice ideas, but the sad little two burner, electric hot plate sends them all packing, as does the painfully sharp looking corner on the bench. I love the padding on the stairs and the railing. I don’t quite understand the TV ( TV’s?) though. Is the thing in front of the bench a TV place-holder, and is the TV high on the wall for the lofts to share? Might be a clever idea to share the “upstairs TV”, but a bit uncertain about how it really works! That thing under the stairs is a heater/fireplace, that one might be electric and when you turn it on it looks like flames inside. They look better when they are built in but that one looks to be just hanging on the wall. My daughter has one that runs on natural gas and it heats almost the whole 2 bedroom regular house except for the laundry room, surprising how much heat such a little thing can put out. Unfortunately, we couldn’t do a built in in this case. And you are right, this heats up to 200 sq ft. The main heat source is the AC?Heat combo which is 10,000 BTU’s. We like to out the fireplaces in, because it truly gives it a homey look and feel. Thank you for your feedback, we truly appreciate it! Real and normal sized steps with banister. Yay! I don’t like the location of the AC or the TV and the microwave would have to come down off the top of the refrigerator. I’d need a ladder to get up there. BTW, I didn’t see a ladder for the second loft, but it must be stashed somewhere. Is that little thing under the stairs the heat source? All in all quite nice with some minor changes. 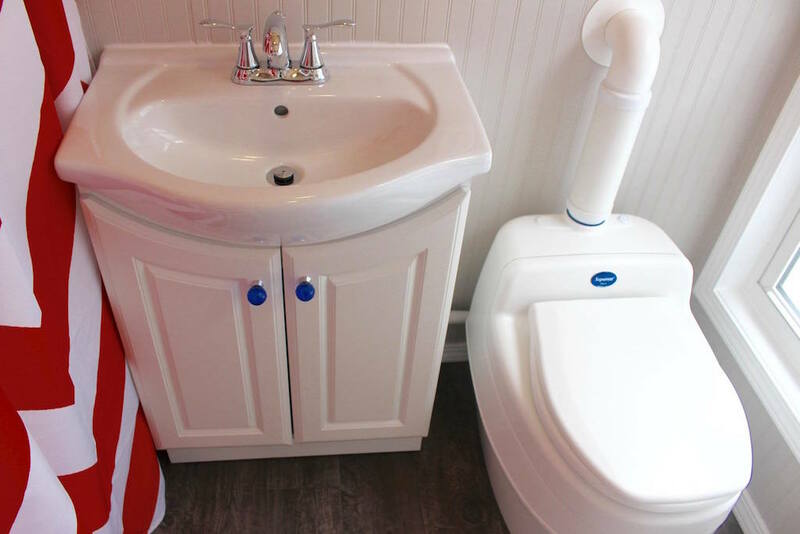 The AC/Heat will be flush mounted at the time of delivery. I’m 5’6″ and my head doesn’t touch it. The TV is on a adjustable brace. You can angle it down or from sided to side. It can be seen from either loft, and the living room. The refrigerator is about 4′ tall. The microwave is easy to reach. The fireplace under the stairs does put off heat, but the main heat source is the AC/Heat combo unit, it is 10,000 BTU’s. There is a fold up ladder for the second loft. It stores in the closet. If someone is interested in purchasing, we are happy to make any changes. Thanks for the feedback, we appreciate it. I think you did a great job with this, it looks very comfortable, very well laid out and you managed to make a tiny house look spacious. Try a split mini A/C next time, people don’t seem to object to those as much. Personally, I love window units, except for the part about losing window space. We bought a plantation house that had been retrofitted with central air and heat with vents in the floor, I hated it! With 12 foot ceilings it never got cool enough for me and when the heat was on and the rest of the family comfortable, I was miserable. Hubby put a window unit in the bedroom for me so that I would have one room in the house where I could be comfortable, so I moved my desk in there too LOL. Finally he just put them in every room and the electric bill went down by 2/3 because we were only cooling the rooms that we were in, that was a nice surprise. Window units are great, I don’t know why people don’t like them, they are easy to clean too, no more hiring a company to clean the duct work every year. I am trading in my plantation for a tiny house now that the kids are grown and moving to a much cooler climate but I am still going to get AC, it never gets cold enough for me. Thank you, we are in LOVE with it! Haha, we are opposites! I love hot climates! My husband and I are going to retire on a beach in Florida in one of our tiny houses:) Thank you for your feedback. We appreciate it! I’m curious, what’s behind the door next to the bathroom, under the second loft? The kitchen looks great! It’s nice to see a tiny home that would work well for a baker or cook. With the wide variety of compact ovens and cook tops available, the counter space here would allow for a lot of customization. The staircase and the black pipe ‘guard rails’ are nice touches, too. Good to hear the TV and A/C would be able to be moved. Both look a bit intrusive to me in the pics here. That said, the pictures and what one actually experiences inside could be two very different things. Overall, a really nice home for a very reasonable price. I’m going to check out your website for certain. Keep up the great work! 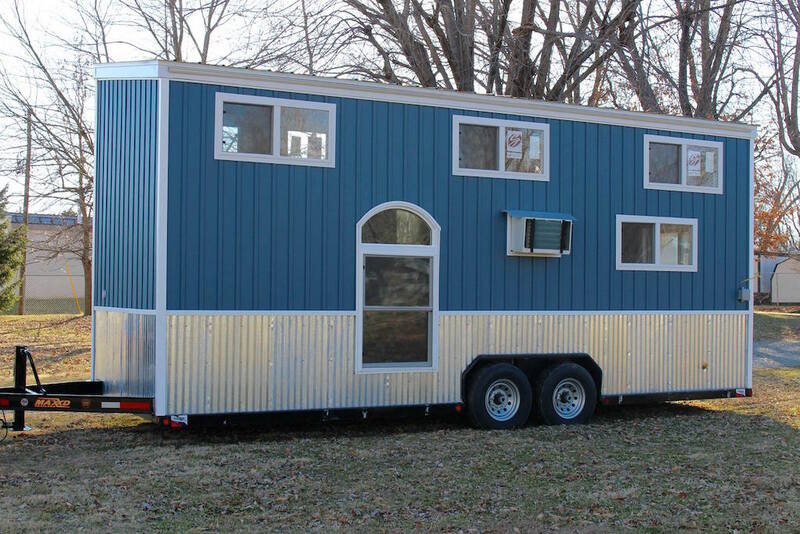 What is the trailer size that this tiny house sits on?